I’m not going to do a full kitchen tour today for two reasons: 1. I don’t live alone so the kitchen isn’t fully vegan and 2. my cabinets are a mess. I’m in the middle of reorganizing the ones that are specifically mine, but it’s a work in progress. Instead, what I’m going to do is share with you a new kitchen addition since last year’s Vegan MoFo. My nephew gifted my sister and me a Nutribullet last Christmas. The one we got is red, has two small and one large blender cups, two lids, an extra screw-top handle for the handle-free cups, a blender blade and a mill blade. 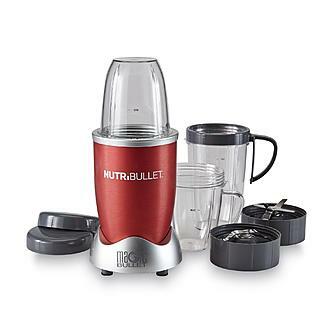 My nutribullet is like this one. This thing is a little powerhouse. We use it for small batches of hummus, for smoothies, to grind chia seeds, to make flour out of whole grain buckwheat, to make nut meal and for various other things. It’s easy to clean – all dishwasher safe, except the base obviously. It’s also easy to take the cups on the go…take off the blade, flip the cup, and screw on the lid. The only real issue we have with it, is it takes just the right hand to get the cup/blade to connect with the base. I’ve found that if you turn it so it fits into the base and makes a slight “drop” into to then you can the push the cup down to blend. It was hard to get this down at first, but I think I have it now. 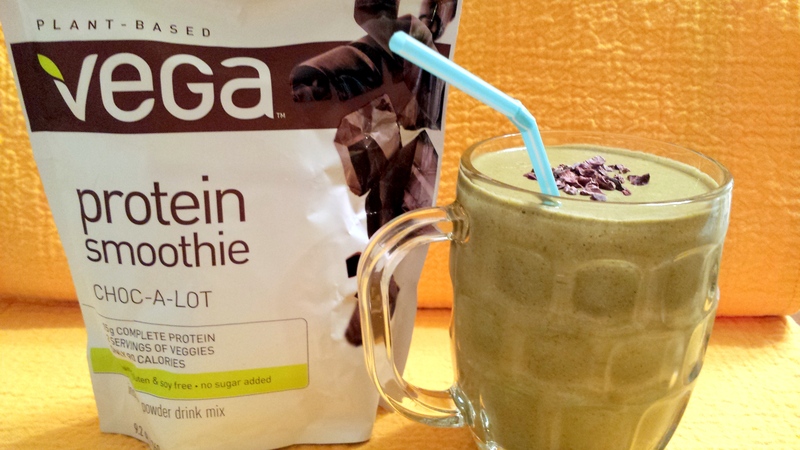 The other day, I made a smoothie in it using Vega Choc-a-lot protein smoothie. As a recall, this was 1 scoop of the protein powder, 1 small banana, a couple handfuls of kale, coconut milk (beverage, not the canned kind), and a small spoonful of peanut butter. 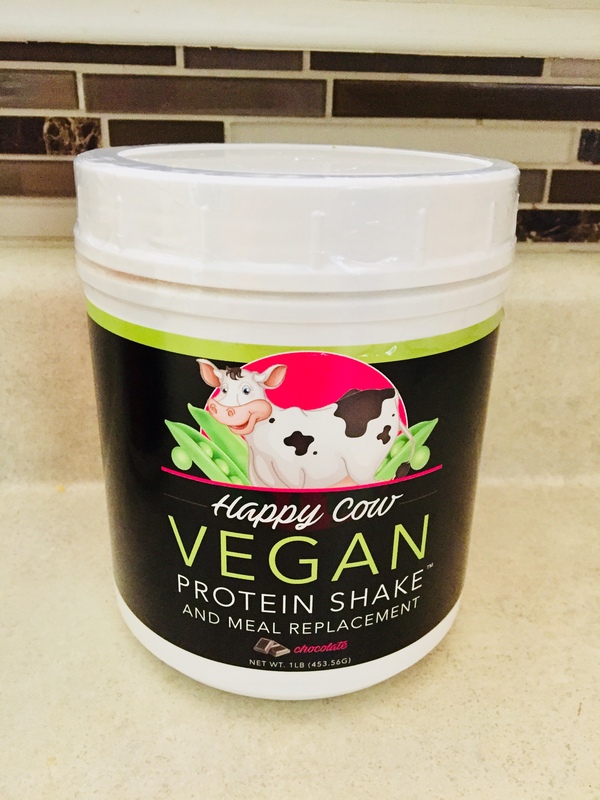 Made with pea protein, hemp protein and other proteins (no gluten or soy), there’s 15 grams in a single scoop. It also advertises two servings of veggies per 90 calorie serving. I like using the variety of protein and getting so much nutrition in a small serving. But, there’s one caveat. The stevia taste is strong. If you dislike stevia, you won’t like this protein powder. I’m ok with stevia most of the time and it’s even a little strong for me. I find that using a banana as the fruit helps temper it as does adding a little agave or maple syrup. I realized as I was writing this post, that I’ve never used it in just a glass of non-dairy milk like it suggests on the package. It didn’t really change my view on the powder. It doesn’t fully stir in so it wasn’t smooth like a chocolate flavored milk and the taste is still stevia-like with a mild chocolate flavor. So, it’s a mixed review from me…it’s something I buy because I like the nutrition, but I have to mask the taste a bit to really enjoy it.